In the years leading up to the second world war, many countries grappled with the problem of making anti-aircraft fire more accurate. The speed of an aircraft, plus its distance from a gun meant that if a gunner simply put the sites directly on the plane and fired, the shells would always fall behind the aircraft and miss. Additionally, smoke and vibration from the gun could make the target harder to see and follow. The solution that many world navies chose was a gun director, mounted near the gun, that could accurately determine range, vector, and speed. 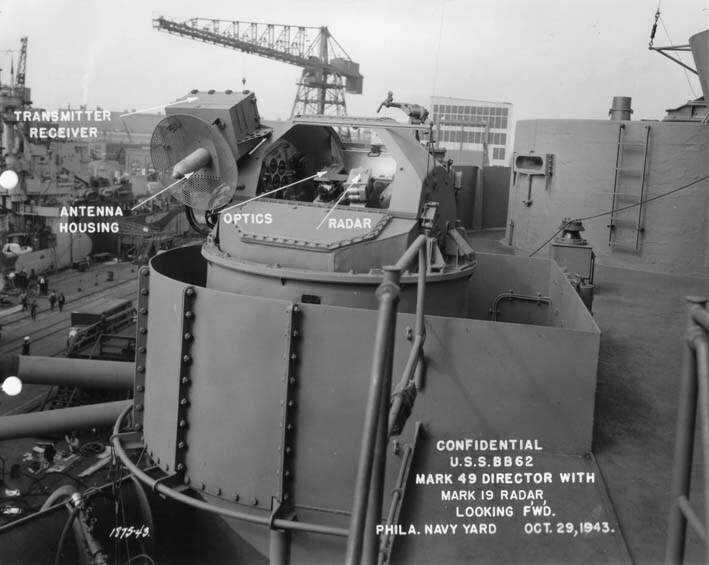 Early units were purely optical in nature, but by the end of the war state-of-the-art included radar powered units that could control multiple gun mounts at once. The Mk 49 director was a short-lived anti-aircraft fire director used on some US warships in the middle to late phase of World War II. It was a replacement for the earlier Mk 45, which had turned out too large, heavy, and complex for most shipboard installations. The Mk 49 itself, however, suffered from high complexity and maintenance needs itself, and the success of the simpler Mk. 51 design caused its withdrawl starting in October of 1943. 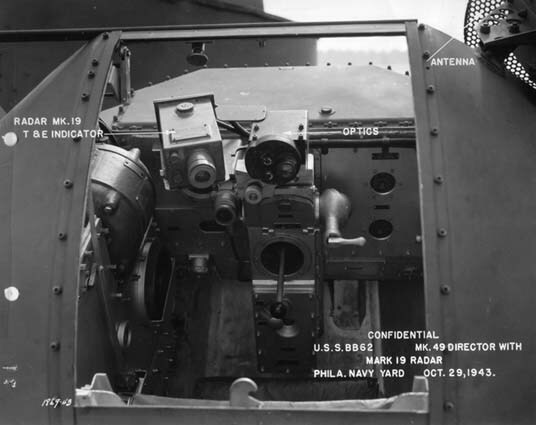 Unlike the Mk 51, wherein the operator stood behind a pedestal-mounted unit and aimed it by turning and tilting with his arms and body, the operator sat inside an enclosed ball with an opening at the top front. Entry was through a hatch on the top rear, and once energized the ball portion would rotate on two axis for train and elevation. Originally designed to be used with the 1.1" mounts early in the war, they were mainly used with the twin and quad 40mm anti-aircraft mounts that replaced the quad 1.1" mounts in 1942. 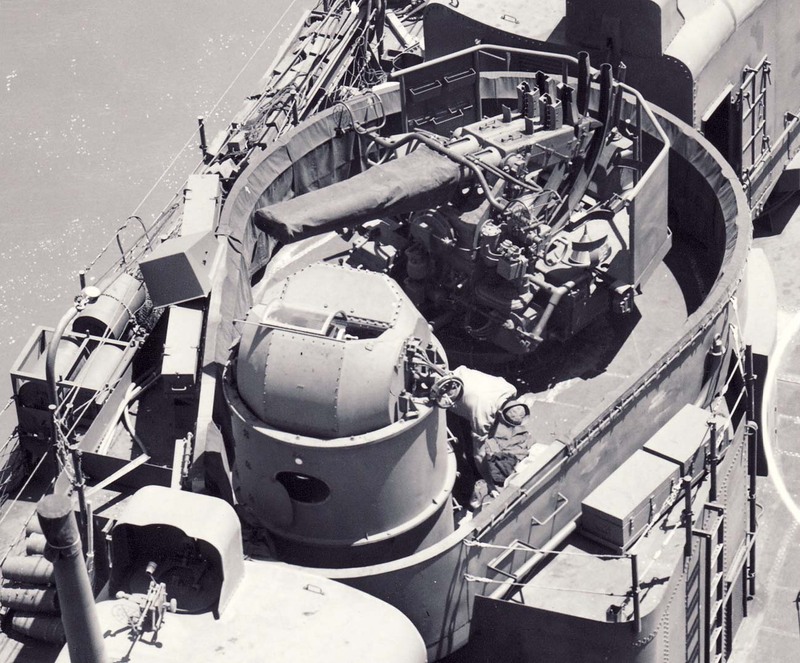 The one advantage the Mk 49 had over the Mk 51 was that radar could be mounted, allowing for directing during attacks within periods of night time or low visibility. 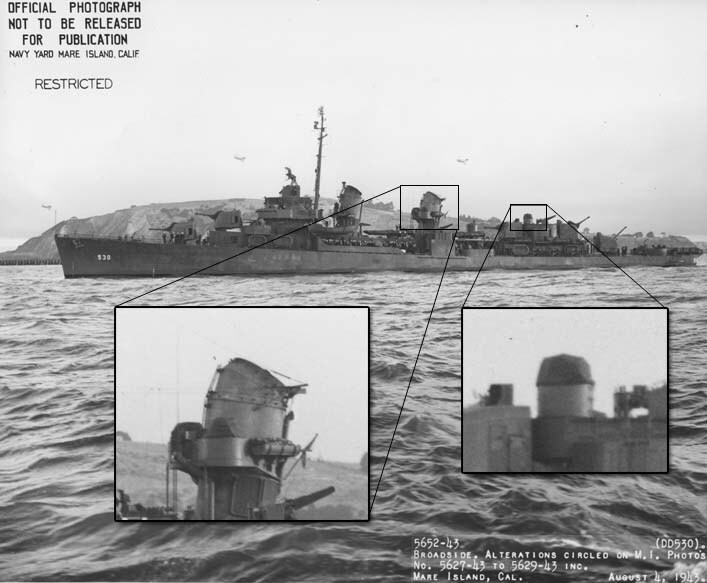 For this reason, radar equipped units were kept on some larger ships until later in the war, when newer systems such as the Mk 57 and 63 came online. 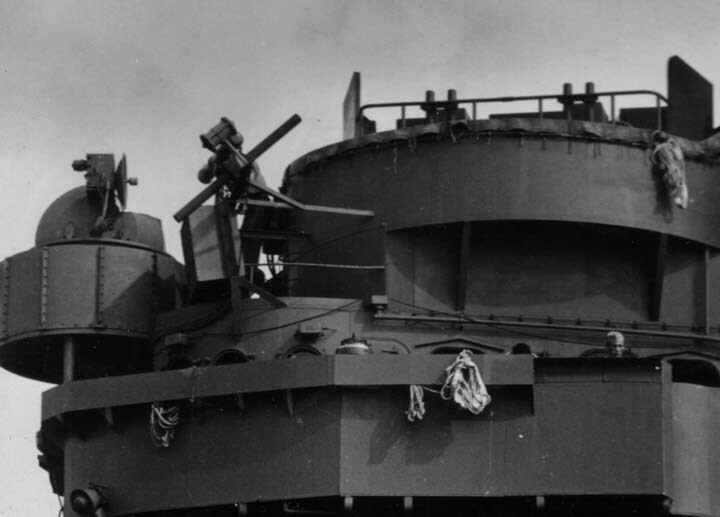 The radar, when mounted, was always to the right of the operator on the side near the pivot point. 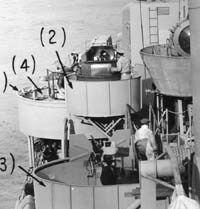 Two types of radars were carried although for all practical purposes they would be indistinguishable in conventional ship modeling scales. Schematics for the Mk 49 have not, at this time, been located, but some details are known from the textual records which have been located. If a Mk49 was to be encased in a splinter-shielded tub, minimum diameter of 6', was called for, and it was to be built in segments to facilitate maintenance. The maximum height for the tub was 3' to allow the Mk 49 to depress enough to be used during periods of moderate rolling. 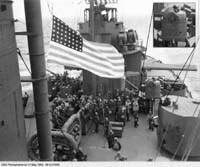 Nearly 350 were delivered before installations were halted in October of 1943. The first 269 were built without radar, nearly 50 with the Mk 11 radar, and an unknown number, possibly the balance (roughly 30), with the Mk 19 radar. Once the viewer is familiar with the "R2D2" is appearance of the Mk 49 and the locations they were normally mounted, it is generally not too difficult to locate them and differentiate between somewhat similar sillouettes such as searchlights. Below is a gallery of photos showing some of the variations of the unit and installations, as well as lists of ships that we know carried the Mk 49. When specific dates are known for the installation or removal they are given, or a specific date that we know that they were at least present; the modeler or research may use yard visits to guess at the installation and removal dates in some cases. If you have any corrections or additions, please contact the webmaster of this site or Tracy White. Close-up shot showing basic components of Mk 49 director including enclosed operator compartment and and Mk 19 radar antenna. Both the Mk 11 and Mark 19 radars were used. USS New Jersey (BB-62) at the Philidelphia Navy Yard on October 29, 1943. Port side looking forward towards armored conning tower. Photo from the records of Puget Sound Naval Shipyard, Seattle NARA. Photo from the rear of the Mk 49 showing the operator's seat and controls. Note that this version has both the optical site and a radar; early versions lacked the radar unit and sites that the later ones possesed. 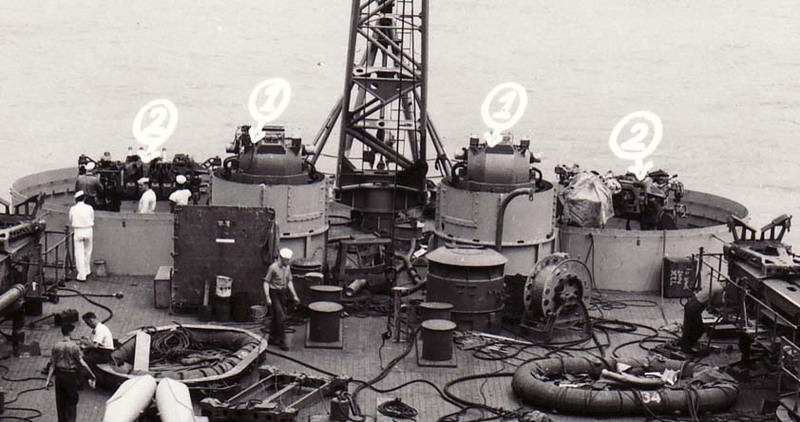 Navy documentation in late 1943 indicated that the optical-only units were no better than the alternative Mk 51s and required much more maintenance; the only advantage the Mk 49 had was in nighttime and low-visibility environments when the radar was installed. 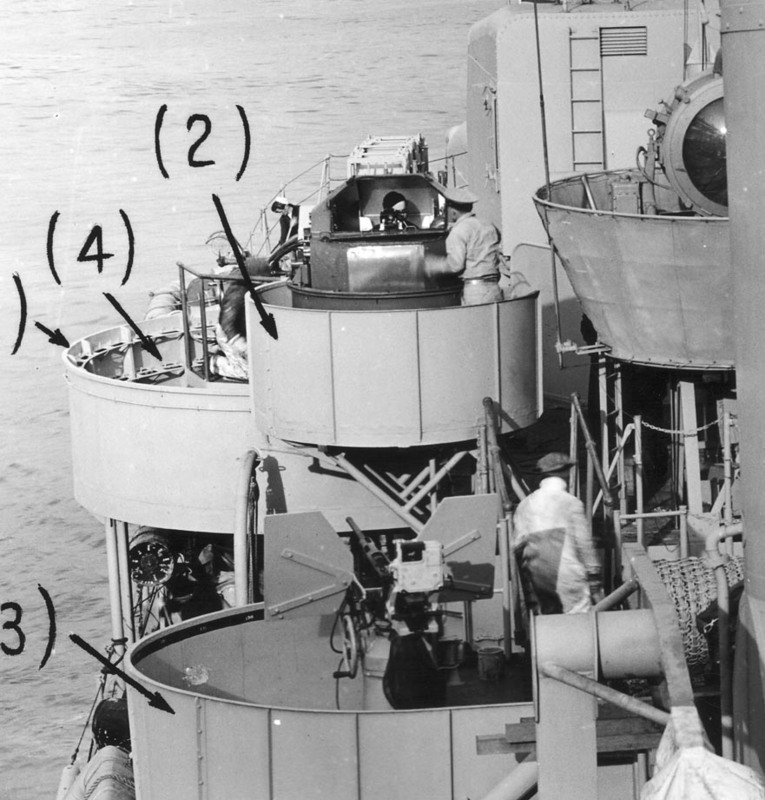 Stern installations of unknown version of Mk 49 aboard BB-56 Washington, August 1942. These units may have been outfitted with optical range finders on the sides, or perhaps they are gyros. Official USN Photo from photo files at NARA II. Midships installation on BB-38 Pensylvania, May 1943, looking astern from forward superstructure.. Pennsylvania carried these Mk 49s during her actions in the Aleutians campaign at Holtz Bay and Chicago Harbor, Attu. 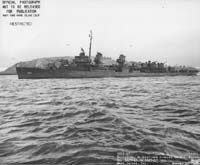 Gleaves-class destroyer USS Bristol (DD-453) on 7 January 1943 after she received the two twin 40mm AA mount upgrade. View is looking aft on the starboard side. 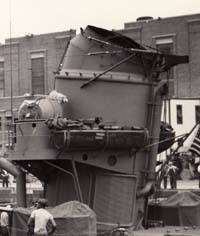 Note the crewmen in and next to the director for scale purposes, as well as the absence of radar seen in the above photos. Photo from the photo files at NARA. Fletcher-class destroyer USS Caperton (DD-650) on 15 August 1943 at Boston Navy Yard. She was completed with three Mk 49 directors controlling the aft three twin 40-mm mounts and two Mk 51 directors in the bridge wings controlling the two forward twin 40-mm mounts. Official USN Photo from the BuShips photo files at NARA (19-N-). USS Trathen DD-530 near Mare Island August, 1943. Three Mk 49s without radar are present. Photo from NARA San Francisco "Mare Island Naval Shipyard Ship Files"
Close up of aft Mk 49 on DD-530 with twin 40mm mount the day prior to the above picture. Note lack of radar on this earlier unit, sliding plexiglass windscreen, and open access hatch on the pedastal. View is looking aft and to starboard. 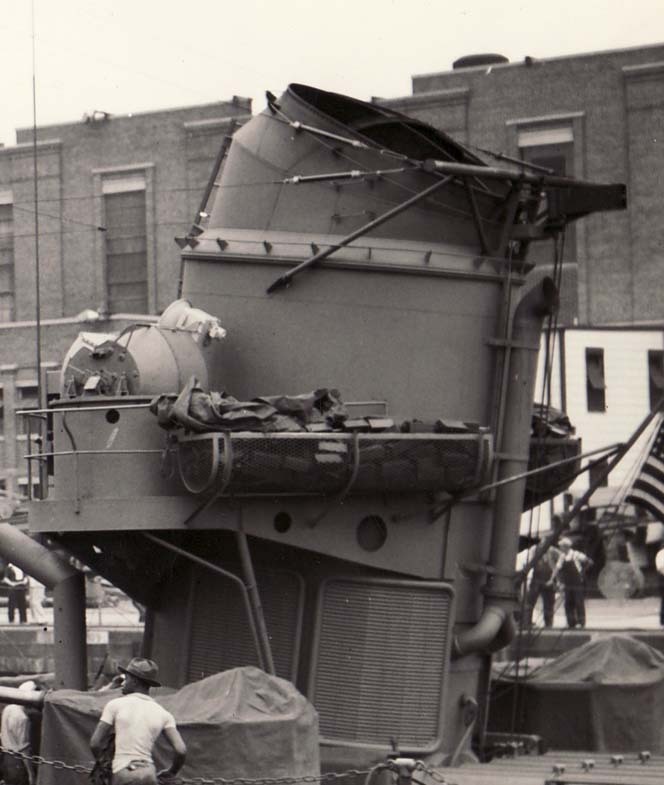 USS Hall (DD-583) a Boston Navy Yard built unit on 4 August 1943, is one of the earliest photos found with the radar (Mk 11 or Mk 19, but probably Mk 11) installed. This is about as close-up a view as has been found so far on a Fletcher. Photo from the BuShips photo files at NARA (19-N-). USS Cotten DD-669 with two oh her Mk 49s in view on the aft stack. Not that the radar is in the same side of the unit regardless of what side of the ship the unit is mounted. Not too, that the reflector dish is solid, likely making this the earlier Mk 11 variety of radar. 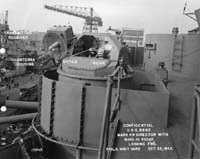 Forward installation of a Mk 49 and radar on CV-16 Lexington, December, 1944. This mount was installed right on top of the bridge pilot house and controlled the mount to the right of it in the photo. Official USN Photo from RG 80-G at NARA II. The "Verified Install Dates" at this point are dates we have photographic evidence that a director was present. If we have records that indicate install and removal dates that will be noted. CV-11 Intrepid 1 (Behind #2 twin 5" mount & between aft island 40mms) Commissioned - after shakedown? BB-61 Iowa 4? ? ? ? BB-62 New Jersey 4 ? October, 1943 ? DD-546 Brown 3 July, 1943 None ?? DD-551 David W. Taylor 3 September, 1943 Two Mk 11/19, Oct 1943 ?? DD-556 Hailey 3 Septmeber Two Mk 11/19, Oct 1943 ?? DD-577 Sproston 3 May, 1943 None ?? DD-582 Conner 3 June, 1943 1/2 Mk11/19 ?? DD-587 Bell 3 March, 1943 None ?? DD-588 Burns 3 April, 1943 1/2 Mk 11, August, 1943 ?? DD-589 Izard 3 May, 1943 2 Mk11, September, 1943 ?? DD-630 Braine 3 May, 1943 None ?? DD-657 Charles J. Badger 3 July 1943 2 Mk 11, August, 1943 ?? DD-669 Cotten 3 July 1943 2 Mk11, August, 1943 ?? DD-671 Gatling 3 August, 1943 2 Mk 11/19, September, 1943 ?? DD-673 Hickox 3 September, 1943 2 Mk 11/19 October, 1943 ?? DD-675 Lewis Hancock 3 September, 1943 2 Mk19, October, 1943 ?? DD-681 Hopewell 3 September, 1943 2 Mk19, October 1943 ?? 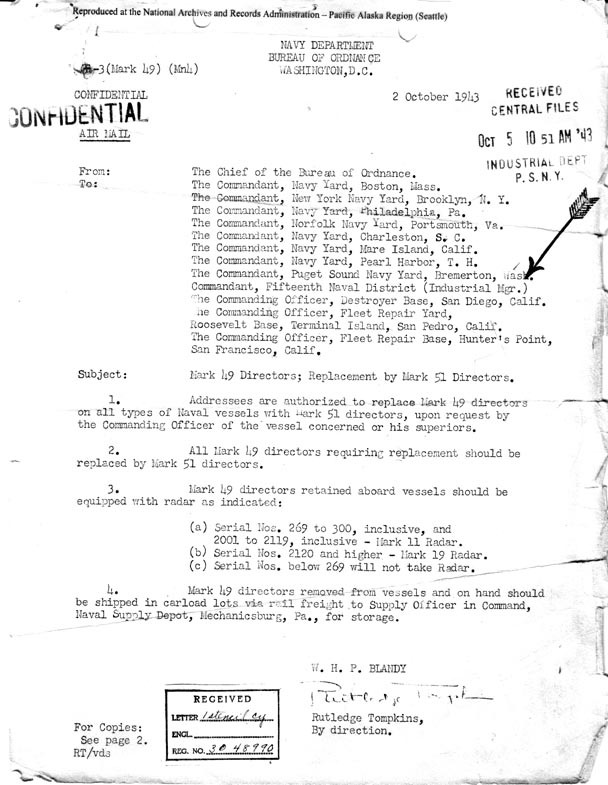 DD-685 Picking 3 September, 1943 None ?? DD-688 Remey 3 September, 1943 2 Mk11/19, October, 1943 ? ?